William J. Bernstein has written a wonderful book for “adult” investors who are comfortable with basic math and statistics and who also enjoy a good turn of phrase. Bernstein, a retired neurologist turned financial theorist, has written about a dozen books, perhaps most memorably The Intelligent Asset Allocator, The Four Pillars of Investing, and The Investor’s Manifesto. Rational Expectations: Asset Allocation for Investing Adults (Efficient Frontier Publications, 2014) is his latest offering. And, for those who realize that sound investing is an informed process, it points the reader to resources with which he may be unfamiliar, such as Kenneth R. French’s 2008 presidential address to the American Finance Association on the cost of active investing and some books on financial history “listed in descending order of importance.” (p. 115) Heading that list are Edward Chancellor’s Devil Take the Hindmost (“what manias look like; how to recognize—and hopefully avoid—irrational exuberance”) and Benjamin Roth’s The Great Depression (“what the bottoms look like; how to keep your courage and your cash up”). All in all, Rational Expectations is an eminently worthwhile read for the investor who hopes to retire one day, even if not from investing itself. A few months back a reader asked me to recommend a good introductory book on macro trading, and I was stymied; I couldn’t think of a single title. Greg Gliner, a member of the global asset allocation team at AQR Capital Management and formerly an analyst at Tudor Investment Corporation, has set out to fill that void with Global Macro Trading: Profiting in a New World Economy (Bloomberg/Wiley, 2014). The book assumes practically no knowledge either of trading vehicles or of trading itself. Imagine a fresh college graduate who majored in, let’s say, history and who has just been hired by a global macro firm. He knows next to nothing about bonds, commodities, foreign exchange, or international economics. He barely knows his way around equities and draws a blank when asked about technical analysis. Presumably, since the firm took a gamble on him, he’s a quick study. They give him Gliner’s book and tell him to digest it whole before his first day of work. Then and only then is he ready to start learning about hands-on global macro so he can eventually become a productive member of the team. As this description indicates, the book—to be more precise, the second part “Global Macro Trading Foundation”—includes chapters on foreign exchange, equities, fixed income, and commodities, as well as (not telegraphed above) the role of central banks in global macro and economic data releases and demographics. These chapters conveniently bring together in one place a multitude of information that, though for the most part readily available, is scattered across the internet. The first part of the book deals more generally with trading, with the longest chapter devoted to technical analysis. It also has a chapter on the trading process, sizing trades, and monitoring performance. Here some tricky concepts are dealt with in a perfunctory way. Correlation gets two very short paragraphs; the Sharpe ratio, Sortino ratio, drawdowns, and VaR are dispensed with in two pages. Gliner spends a little more time on monitoring performance and offers helpful hints. The chapter on systematic trading is appropriate for readers who have some background in the markets and who are interested in portfolio construction. It is unfortunately too brief to be more than a teaser. Gliner takes the four assets he discusses in the book (currencies, equities, fixed income, and commodities) and suggests that “there are two portfolio strategies that can be deployed in these assets: directional and relative value. Relative value is more desirable for capturing various factors over time and requires greater leverage and position sizes relative to outright directional trades.” He continues: “Each asset has an overlay of factors … that can help define the expected value of each strategy as being under- or overvalued. For purposes of this chapter we examine value, trend, carry, and fundamentals as our strategies. … One must identify the [optimal] weights of each strategy to calculate their weights relative to one another.” (p. 93) “The basic construct of a systematic model involves breaking each strategy style apart and selecting the factors for value, trend, carry, and fundamentals that gives the highest Sharpe ratio possible and lowest drawdown ex ante…. Prior to summing the four strategy styles together, one must take factors such as illiquidity, tail risks, growth, and inflation into account.” (pp. 98-99) As should be evident, systematic global macro is no walk in the park. Global Macro Trading is a broad-based primer. It gives the reader a good sense of what is involved in this general strategy and where he needs to get up to speed. There are not two but four Koch brothers—Frederick, the “I’m not gay” firstborn who eschewed business for the arts; Charles, the quintessential hard-nosed businessman and head of Koch Industries who spearheads the fight for the political soul of the country; and twins David, “an endearing figure on the New York society scene” and Charles’ ally, and William, the litigious Koch empire spoiler and America’s Cup winner. To understand the Koch brothers it is necessary to understand their father Fred, since the old saying “The apple doesn’t fall far from the tree” is particularly apt in this case. His pathological anti-communism, which he saw lurking behind American foreign aid, modernist painting, the American civil rights movement, government handouts, and labor unions; his distrust of government in general; and his sometimes questionable business practices became, along with his vast fortune, his legacy to his sons. Worse, “the toll that the Universal Oil Products battle took on Winkler-Koch’s revenues had pushed Fred and his partner out of the United States and into the welcoming embrace of Josef Stalin’s Soviet Union.” (p. 35) In 1929 Winkler-Koch signed contracts to design and construct fifteen oil cracking stills in the U.S.S.R. The following year, when Fred went to the U.S.S.R. for a month and a half to check on the progress of his engineers, he was appalled at the conditions in the country. He was also subjected to the incessant taunts of his “minder” that the communists would infiltrate every aspect of American society. “The schools, the churches, the unions, the military, the government—all were communist targets.” (p. 37) When he returned home, Fred began a fervent anti-communist campaign. His zeal eventually brought him to the notice of Robert Welch, founder of the John Birch Society. Fred joined the Society’s National Council and “threw himself more vigorously than ever into the fight against communism.” (p. 43) Although many people viewed him as “a red-baiting crackpot,” he was undeterred. For instance, he tried, and failed, to remove an admitted communist from the faculty of MIT, where three of his sons were studying. “Of the four brothers, Charles most heartily imbibed their father’s hard-line political views…. Like his father, Charles occasionally speechified about the dangers of collectivism and the encroaching welfare state. … With Koch family friend Bob Love, Charles opened a John Birch Society bookstore on Wichita’s East 13th Street, down the road from his family’s compound. He curated a section there on Austrian economics (a school of thought that heavily influenced libertarianism) and enjoyed introducing customers to the works of economists including Ludwig von Mises and Friedrich Hayek. “A family acquaintance recalled visiting the Koch family’s home one day in the 1960s, carrying a dog-eared copy of Ernest Hemingway’s The Sun Also Rises, the assigned reading in a college literature class. When Charles answered the door, his eyes lingered on the book’s cover. After an uncomfortable pause, he finally asked the visitor to leave the Hemingway book outside, since it could not enter the house. “'Is there a problem?’ the puzzled visitor asked. It wasn’t like he was carrying a copy of Tropic of Cancer. “The guest entered. Hemingway remained on the stoop. Fifty years later Charles and David Koch are still fighting to remake America, promoting free-market economics and mainstreaming libertarianism. And with record revenues of $115 billion in 2012, Koch Industries can keep their dream alive. Clash of the Financial Pundits: How the Media Influences Your Investment Decisions for Better or Worse by Joshua M. Brown and Jeff Macke (McGraw-Hill, 2014) is a book by financial pundits about financial pundits. It alternates between reflections on the financial media (I assume written by Josh Brown) and interviews conducted by Jeff Macke. The interviewees are Jim Rogers, Ben Stein, Karen Finerman, Henry Blodget, Herb Greenberg, James Altucher, Barry Ritholtz, and Jim Cramer. Since both authors are members of the financial media (Brown is author of The Reform Broker blog and a regular contributor to CNBC, Macke is the host of Breakout on Yahoo Finance), the reader can’t expect to be told: “just turn off the news.” Instead, the authors try to explain which pundits may be worth listening to and which ones are just noise, or worse. For investors who are not intrinsically skeptical and who have no idea of how to separate the wheat from the chaff, the authors offer a few good pointers. For the rest of us—hardened, cynical folk that we are, the interviews offer some good tidbits. The book has a strange subtext, along the lines of “I once was lost but now I’m found.” Jeff Macke recounts his career-killing “Car People” episode on the now defunct evening program CNBC Reports and his subsequent emotional descent and recovery. And he interviews three insiders who to a greater or lesser degree faced their own professional crises: Henry Blodget, banned from the securities industry but now the editor and CEO of Business Insider; Jim Cramer, who took a drubbing on Jon Stewart’s The Daily Show; and James Altucher, who seems to specialize in failing and bouncing back—and writing about it. Whom do I personally consider worth listening to? First, those who readily admit they don’t know the answer. Bob Shiller comes to mind here. Second, those who move markets, such as David Tepper. And third, those who are both bright and entertaining, with Warren Buffett being perhaps the prime example. I assiduously avoid Cassandras, dim bulbs, and pompous pretenders—and does that ever save me a lot of time! Today I conclude my series of posts on Paul Cootner’s classic book with some excerpts from his brief introduction to Part IV, “The Statistical Analysis of Option Prices.” Don’t forget that the articles in this section were written before the Black-Scholes pricing model was developed (1973). “The second paper by Kruizenga and the one by A. J. Boness, both deal with the ‘rationality’ of put and call prices. … If both the buyer and the seller of such options could estimate, without error, the parameters of the distribution of stock prices, and if they each hoped to maximize their mathematical expectation of wealth, options would be so priced as to leave each without profit from repeated transactions. To test the correspondence between this view of option pricing and actual prices, Kruizenga examines hypothetical transactions at prices submitted to the Securities and Exchange Commission in the period 1948-1956. Boness looks at actual transactions during a shorter, and different, period (1958-1960). Kruizenga finds option purchasing to be mildly profitable; Boness finds it highly unprofitable. … Yet another study, by Richard Katz (1963, 1964), covering a slightly longer and different period, finds intermediate results: both purchases and sales of options are slightly unprofitable, these losses arising from the commissions paid to intermediaries. “Osborne’s second paper (1963) … deals with differences in the behavior of low and high price stocks, the distribution of trading volume, ‘seasonality’ of trading patterns and prices, and the tendency of buyers and sellers to ‘prefer’ certain prices to others. All of these deviations from a random walk have interesting implications for the theory of stock price formation. “The most striking material that Alexander brings to bear on the random walk question is … his investigation into the sources of the dependence of stock price changes. Such dependence does not appear to stem from the distribution of daily price changes themselves, since price series constructed by randomly rearranging the order of actual changes do not show the same nonrandom behavior. Thomas Bulkowski is probably the best known chart pattern researcher. Among his credits are the Encyclopedia of Chart Patterns and the three-volume Evolution of a Trader. In this second edition of Getting Started in Chart Patterns (Wiley, 2014), a book originally published in 2006 and newly revised and expanded with updated statistics, he introduces more than forty chart formations. Better yet, he explains how to trade using them. Although the title indicates that the book is for novices, it is equally valuable—perhaps even more valuable—for more experienced pattern traders. Without continually reviewing, testing, and revising pattern trading strategies, it’s all too easy to trade yesterday’s market. In the next two chapters he offers ten buy signals and ten sell signals. For each he explains how to identify the pattern and serves up trading tips. In some instances he also includes sections on measuring success and case studies. Bulkowski can always be counted on to deliver a lively blend of pictures and number-crunching. This book is no exception. “Despite Bachelier’s very early interest in stochastic analysis of speculative prices and Working’s renewed interest in the 1920’s, stock market research from this point on was very slow to develop. While professional practitioners displayed a strong and continuing interest in the stock market, it enjoyed relatively little academic attention until after the debacle of 1929. While such lack of attention was not absolute, it stands out very sharply in comparison with the extensive research on commodity prices and on prices of those financial instruments which came under the rubric of 'money.' 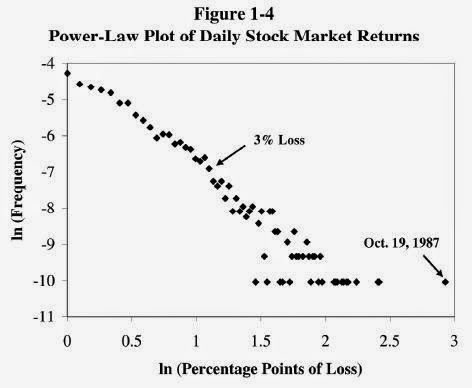 This disinterest was compounded of many parts: the smaller role played by organized equity markets in industrial finance, a conviction that stock markets were the product of mass (irrational) psychology akin to gambling, and a shortage, among economists, of the mathematical and statistical skills necessary for effective research in this field. “These last two reasons bulk particularly large. When research into stock prices did attract renewed attention in the 1930’s, most of it focused among the same American economists who were important in the embryo school of economists interested in the use of mathematics and statistics. Aside from Working, the major name in this period is that of Alfred Cowles. The Cowles Commission (now Foundation) organized the first major collection of statistical data on the U.S. stock market resulting in the publication of Common Stock Indexes published in 1938. Even before that publication, however, Cowles has begun to analyze stock prices from the unique point of view that motivates this collection. “… Moore’s work strongly supports the results found previously by Kendall and Osborne. Autocorrelation coefficients are uniformly small and usually quite insignificant; runs tests support the independence hypothesis, and the distribution of price changes seemed at least approximately log-normal. The careful testing did, however, yield some mildly disturbing evidence which was to become more important in the research and theories of future students. For one thing, the distributions of price changes, while ‘close’ to normal, showed a consistent tendency for more large price changes than expected. For another, autocorrelations of successive one-week changes, while individually statistically insignificant, are predominantly negative to a degree which is statistically significant. Actually, Kendall’s empirical results with price indexes had foreshadowed this, although in the case of indexes, the overwhelming number of autocorrelations at one-week intervals were positive, becoming predominantly negative at longer intervals. Bailey McCann, a member of the Opalesque news and research team, introduces readers to the complex world of hedge funds in Tactical Portfolios: Strategies and Tactics for Investing in Hedge Funds and Liquid Alternatives (Wiley, 2014). In this task she had help from Benedicte Gravrand and Mark Melin, who wrote the chapters on emerging managers and managed futures, respectively. The book also includes lengthy inserts by experts in the field. This is essentially a “how” and “how to” book—how hedge fund strategies work and how to approach investing in hedge funds (investment structures, service providers, due diligence, and investment mechanics). It also has a chapter on regulatory regime changes and impact, both in the US and the EU. One of the strengths of the book is that it takes readers beyond the borders of the United States. Tactical Portfolios has something of a scattershot feel to it, which makes it a poor choice for the novice wanting to learn about hedge fund investing. But more sophisticated readers who are willing to pick their way through the book will undoubtedly find some useful information.